Welcome to this stunning 2story home in Tallyns Reach. Situated on a beautiful treed lot this home leaves NOTHING to be desired. Six bedrooms, 5 bathrooms & 3 car gar. 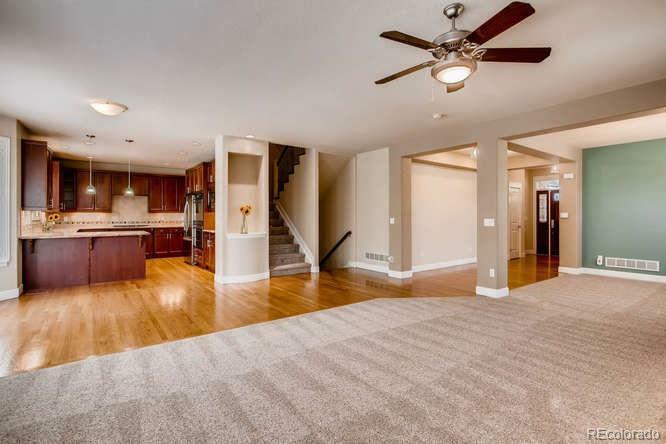 Completely finished basement with bar & rec room area for 3 TV'S. Surround sound w/ Bose speakers. Bedroom and 3/4 bath. Main floor has the study or 6th bedroom, Formal Dining room, large great room with gas fireplace. Gourmet kitchen w/ double ovens, 5 piece gas burner range and newer dishwasher. Granite and high end cabinetry. Wood flooring and tile. AND the carpet is brand new. The homeowners spent over 15,000 for the shutters. Mud room, Desk in kitchen. Upstairs there are 4 bedrooms a lovely MB on suite w/ soaking tub. Sitting room or ?. Garage doors are new, the furnaces (2) and the AC are 3 yrs and 1 yr new. The exterior has just been painted. Hot tub pad w/ electrical. Covered patio. Award winning Cherry Creek schools. Ez access to e470 for DIA. Enjoy Southlands..music, restaurants and farmers market. Offered by Stellar Choice Real Estate.